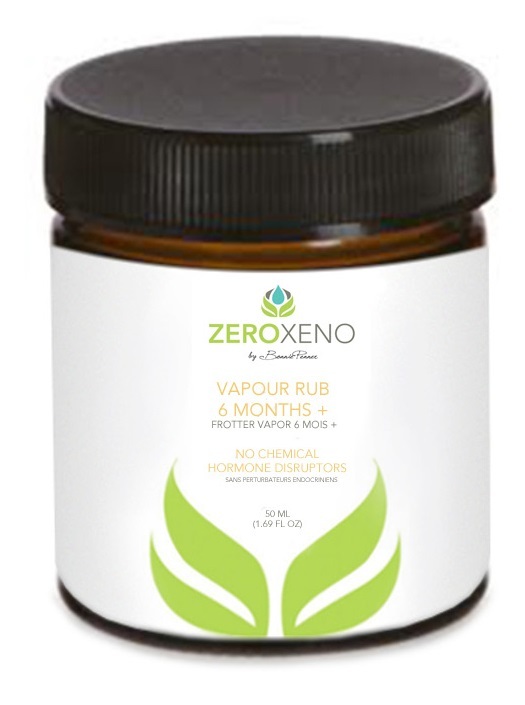 Zero Xeno Baby Vapor Rub 6 Months + is formulated for infants 6 months old and up. It's produced with our in-house formulated base of organic unbleached beeswax and organic oils of olive and coconut. We're proud of our effective, petroleum-free formula. It only contains organic essential oil of spearmint which makes our vapor rub safe for use on infants 6 months of age. We add chamomile essential oil for its natural soothing and calming effect, an added bonus for your child when they're unwell and need that extra bit of pacifying. We only use 100% pure therapeutic grade essential oils for a natural light scent that is delightful and untainted by synthetic fragrances. We don't use masking agents to ensure our scent is clean and unadulterated. Our product is preserved through the management of a natural preservation system our founder Bonnie Penner developed. Safe for topical use on infants ages 6 months and older. Not for use on younger babies. Try our Vapor Rub 6 Years + for those over the age of 6 years. For teens and adults use our Vapor Rub For Adults. Apply small amount to child's chest. Gently rub. 1 year from date of opening product.